THE history of N&W Class A locomotive has been revised by author Ed King ! The original book about this most productive of locomotives has been greatly expanded to include much information not available to the author at the first writing, plus a foldout featuring side elevation drawings of the locomotive and the various tenders it pulled, plus many more photographs (color & B/W). Appendices covering N&W's tenders and the testing of Pennsy Q2 4-4-6-4 conducted on the Scioto Division in August, 1948. The Norfolk and Western... As I Knew It! 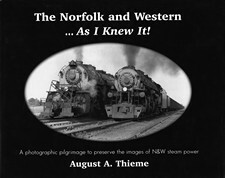 From rail photographer August A. Thieme, this coffee table size volume features over 150 B&W images of steam trains in operation from Norfolk to Bluefield and beyond during the 40's and 50's. See the A, J, and Y class locomotives at their absolute peak... along with E, K, M and Z classes. Electrics in operation between Bluefield and Iaeger. Includes Shenandoah division, Abingdon Branch, Blacksburg Branch! 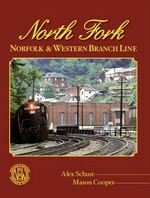 Published by Norfolk and Western Historical Society! 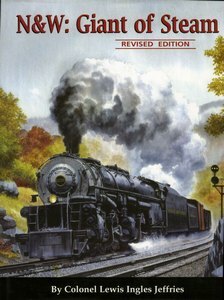 The most definitive story of N&W steam ever written has been updated, revised, and re-printed! 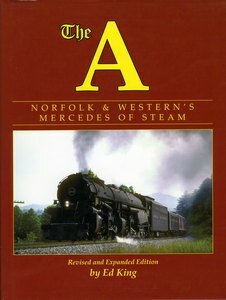 At the time of its original publication in 1980, this book, authored by Colonel Lewis Ingles Jeffries, gave us the story of N&W steam as complete as possible and as no other ever had... but as great it was, there were gaps in the information, due simply to the facts not being available at that time. 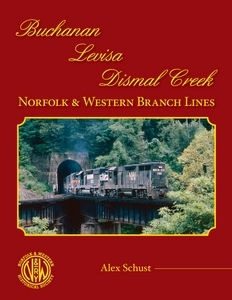 The Norfolk & Western Historical Society’s newest Branch Line Series book uses 248 pages, 93 photographs, 62 drawings and 27 maps to tell how the W.M. Ritter Lumber Company built its narrow-gauge Big Sandy & Cumberland logging railroad from Devon, West Virginia to Grundy, Virginia between 1900 and 1916, how the lumber company extended its logging railroad along the Levisa Fork between 1918 and 1925, and how the N&W acquired the narrow-gauge common carrier and logging railroad in 1923 and made it the basis of the standard gauge Buchanan and Levisa Branch Lines. This soft-cover publication uses 176 black/white pages, 14 maps, 143 photographs and 121 N&W drawings and charts to tell the story of the 242 miles of main line operating between North Kenova and Columbus and Cincinnati. The N&W constructed about eight of those 242 miles and bought the rest. NWHS’s newest publication uses construction records, track charts, ICC Valuation records, newspaper articles and the Norfolk and Western Magazine to tell the why, how, who, what and when of the Ohio portion of this N&W Division. 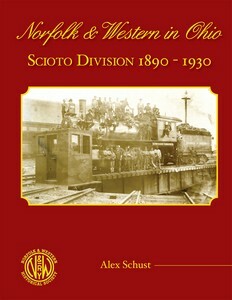 The book details what parts of the Scioto Division the N&W built and which parts were acquired from other railroads between 1890 and 1901. One entire chapter devoted to the building of the East Portsmouth and Joyce Avenue Yards. 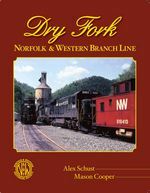 Dry Fork - Norfolk & Western Branch Line , the fourth book in the NWHS’s Branch Line series, is the most extensive book to date with 182 pages. The soft-cover publication uses 118 black/white photographs, 28 maps, and 120 N&W drawings and charts to tell the story of the 44.73 miles of railroad constructed from Dry Fork Junction near Iaeger, West Virginia, to Cedar Bluff, Virginia. Seven color photographs are used on the covers. The Dry Fork Branch, officially started operating in 1906 and is still operating in 2013 as it provides an alternate route between Iaeger and Bluefield. NWHS’s newest publication uses the original surveys, construction records, track charts, siding agreements, contracts, maps and photographs to tell the why, how, who, what and when of this branch of the N&W. Learn why the coal operators had to pay the construction costs. Learn how the branch line changed over the years. Topology maps are used to show the location of the original mines and modern road maps are provided for the railfan. Detailed tipple track charts aid the model railroader in building realistic model railroad mining operations. 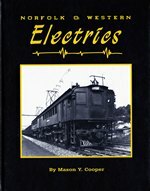 This book covers the whole history of electric train operation on the N&W which eventually ran from Iaeger to Bluefield. Also includes details of the VGN electric operation after the 1959 merger. Many B/W photos and maps. Excellent book on the challenges of the original Elkhorn tunnel with steam and the electric "solution"! Written by NWHS member Mason Cooper. This is a softcover reprint of the out-of-print hardcover edition. Mason Cooper's new 334-page hardback book uses 260 B/W photos and 45 maps/drawings to take the reader through the building and operation of the N&W's Pocahontas Division from the first shipment of coal in 1883 to the N&W-Southern merger in 1982. Mason's research extends through N&W documents, historical data, magazine articles and personal stories to present both facts and recollections on how the division was constructed and operated. Mason's in-depth research shows how the railroad was built, why the railroad was built, and the personal side of operating on the Pocahontas Division over the years. A definitive work by Society members Robert G. Bowers and James F. Brewer. Hardcover; 30 chapters, 4 appendices and Epilogue in 248 pages; 200 B&W and 19 color photos with numerous diagrams. 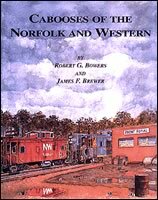 This massive volume covers every class of N&W caboose, including those from merged lines. The original publication by the N&W gives every signal aspect for the railroad, circa 1960, with complete diagrams, indications, and names. Reprinted by the N&WHS in FULL COLOR. If you love the old signals, this 20 page booklet is a treasure trove of information! After the 1978 N&W eighty-two day strike ended, John P. Fishwick, N&W President and CEO, commissioned Robert E. Bedingfield to write a book about the strike. He gave every member of the Strike Team a copy. In his forward to the book, Mr. Fishwick wrote: “This book has been prepared primarily for those who manned the railroads during the strike”. You can now purchase a copy of the N&W Historical Society reprinting of this 6” X 9” hardback 399 page record of the strike, and read personal accounts of service by supervisors who kept the N&W rolling. There are management assessment and performance records, as well as job assignments of those who kept the N&W alive. The N&W was one of five Class A rail lines that were picketed. Read the stories of how they made history. Hardbound, 6" x 9", no photos. 399+ pages.